My husband and I recently celebrated our 10 Year Wedding Anniversary visiting parts of Italy and Spain. Our time in Italy was spent at the Amalfi Coast. Our entire experience felt like a dream. Each town was breathtaking in its own unique way. 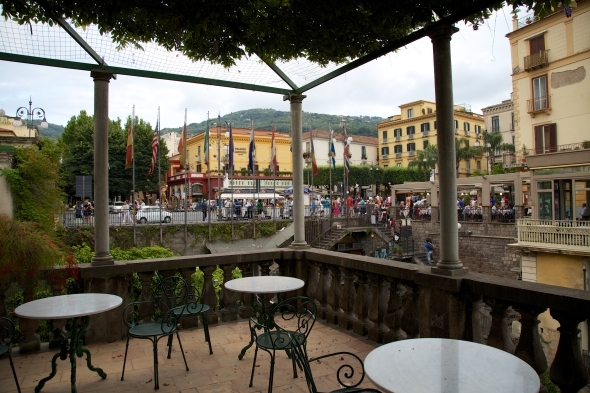 Our home base was the lovely town of Sorrento. 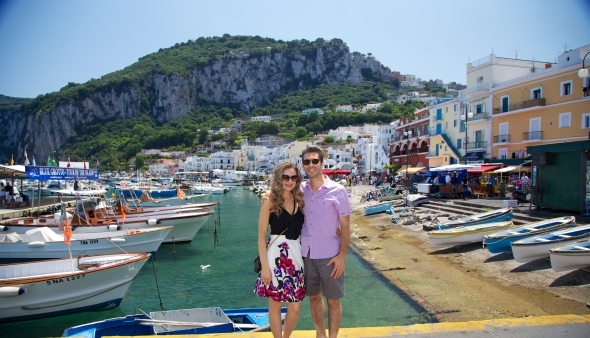 From there we traveled to Capri, a posh and spectacular island that we absolutely loved. Another day was spent traveling The Amalfi Coast, a magnificent short stretch of coastline in the southern coast of the Sorrentine Penninsula in the Province of Solerno. 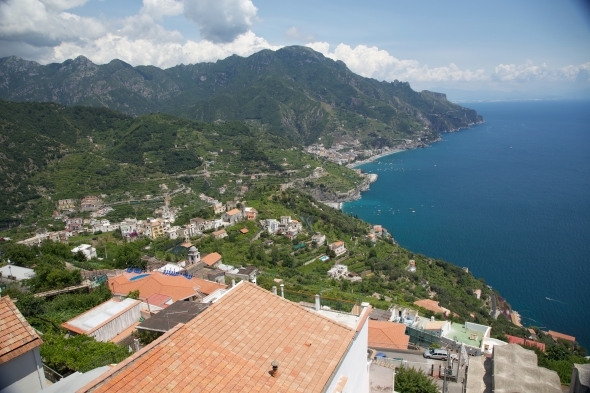 Touring the Amalfi Coast requires a full day of travel and sightseeing. Even though the entire drive was about 25 miles, there were several towns and scenic stops to marvel at and take in. 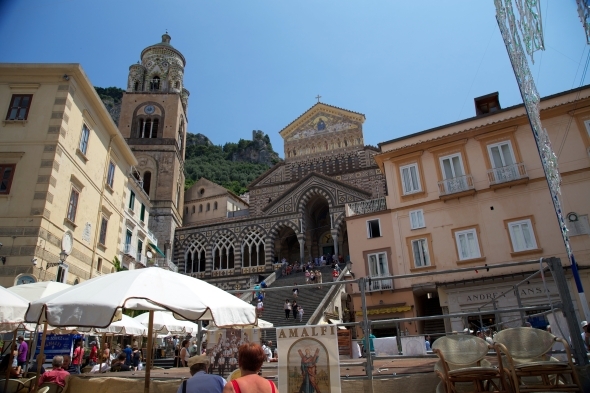 The main towns to visit are Positano, Amalfi and Ravello. 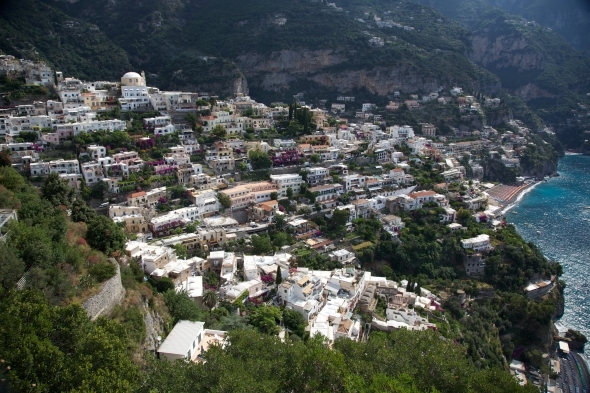 Positano is the most picturesque; a town built on a rock overlooking the turquoise sea. 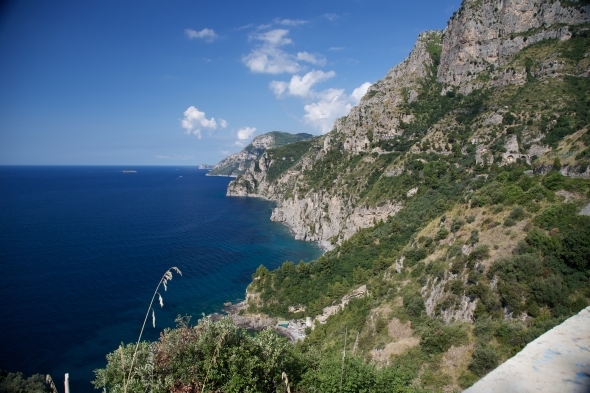 Amalfi is surrounded by dramatic cliffs and coastal scenery. In the center, the stunning Cathedral of St. Andrew will astound you with its beauty. Lastly, the town that became my favorite, Ravello, a haven for artists surrounded by lush green mountains, gardens and trees lined up on the high cliffs. 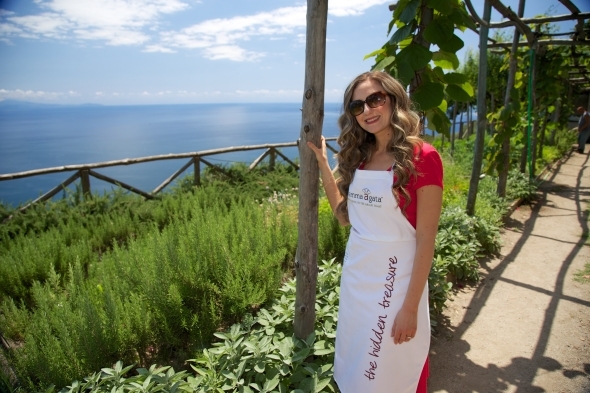 Ravello became even more perfect after my second visit to the town for a cooking class with Mamma Agata. The day felt surreal and I had to pinch myself a few times because it was one of the best days of my life and the highlight of our vacation. Mamma Agata has lived her entire life in Ravello. Her strong passion for family, food and gardening led her to become a well -known and respected chef. The word of her classic family recipes and natural talent for cooking spread, and in time, she became a personal chef for Hollywood actors and politicians such as Humphrey Bogart, Fred Astaire and Jacqueline Kennedy to name a few. As soon as we stepped into Mamma Agata’s 250-year-old family home we felt welcomed by the warm atmosphere and her hospitable family. Our cooking class had 14 students, two of which were children and we instantly felt as if we knew each other for years as we began our experience at “The Hidden Treasure”. When we arrived we were seated outside on a long dining table overlooking the sea. 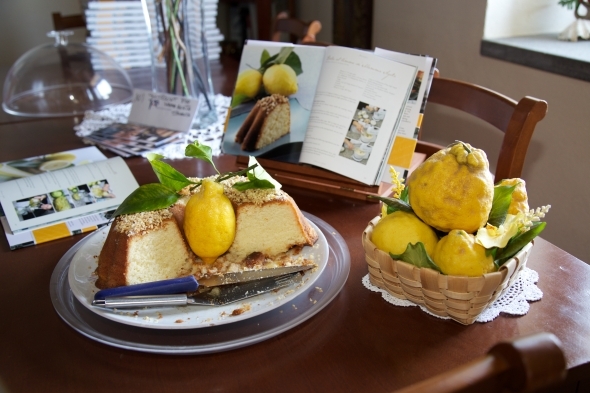 Chiara then explained the day’s fun-filled cooking and eating schedule as we enjoyed Mamma’s famous Lemon Cake. It was to die for! 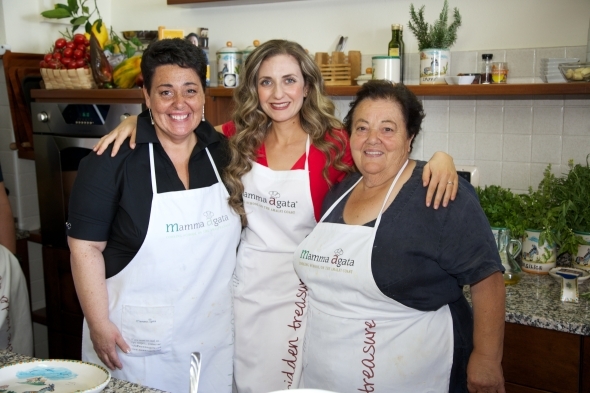 We then made our way to the charming kitchen where we learned to make a basic tomato sauce for several recipes that we would be making that day. 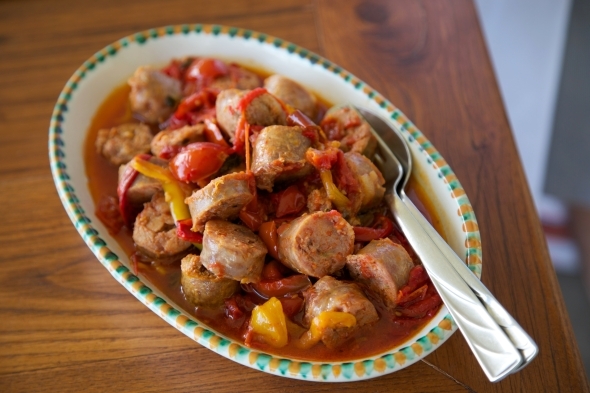 We quickly discovered how Mamma’s simple cooking style and techniques enhance the flavors of the sauce. 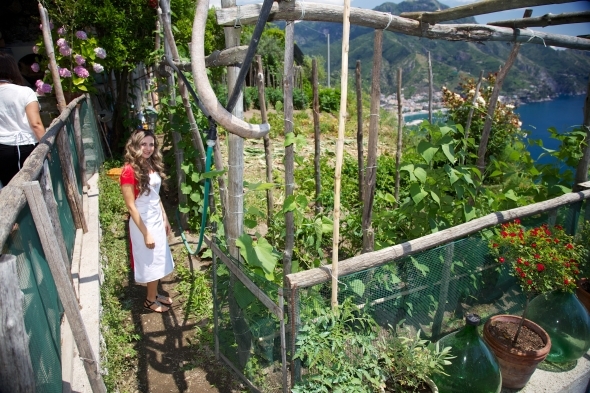 We also were impressed to hear how the family makes their own tomato preserves every summer to last the entire year. 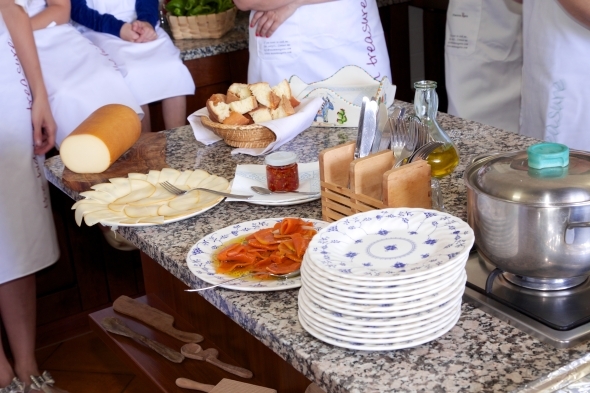 Our short session ended with a breakfast of homemade pumpkin preserves, smoked provolone cheese, freshly baked bread, and house made wine. The day had just begun and I was already giddy! To avoid getting too tired and full from all of the food eating and tasting, we had the privilege of taking several little breaks in which we spent exploring the amazing vegetable, fruit and herb gardens overlooking the endless sea. 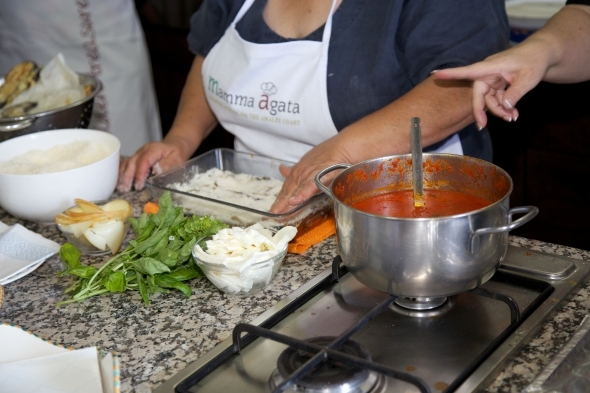 After our stroll in the gardens it was time to learn how to make Mamma Agata’s Eggplant Parmigiana. 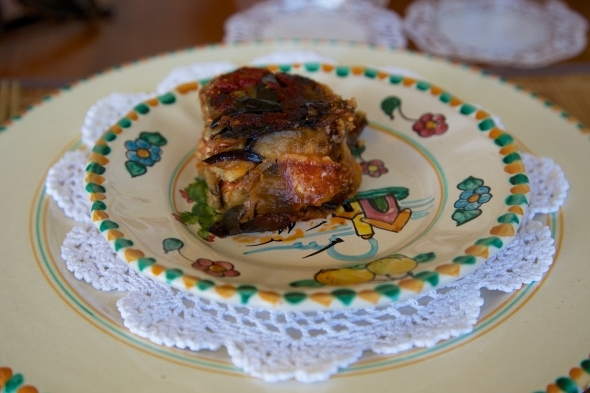 Chiara shared Mamma’s secrets to making the perfect Eggplant Parmigiana. Long, thin-skinned firm Japanese eggplants are best because the water content is critical, less water means more flavor. After salting the eggplant and squeezing all of the excess water, she lightly coated the eggplant with “00” flour, a very fine silky farina flour before frying them to a beautiful golden brown color. Mamma then piled the eggplants high using 3 types of cheeses, cow’s mozzarella, parmesan and smoked provolone; whole fresh basil leaves and a surprisingly small amount of her aromatic tomato sauce. 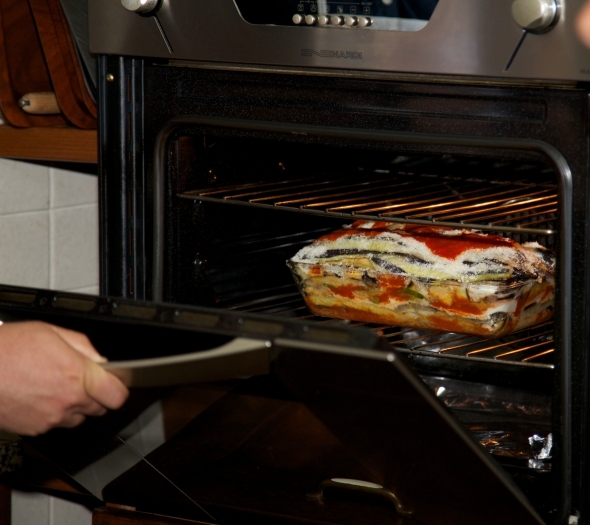 The eggplant masterpiece is then baked to perfection, but we couldn’t devour it just yet. We patiently waited while it rested for one hour to enhance the flavors. The end result was the best Eggplant Parmigiana in the world! It was more like a decadent eggplant cake. I was most excited since it is my very favorite Italian dish. I was quickly inspired to make this at home with my own garden tomatoes, eggplant and basil this summer. Our day of cooking continued. We learned how to make a moist herb and lemon chicken with no oil. Mamma told us to always use dry herbs for chicken because fresh herbs will become bitter. 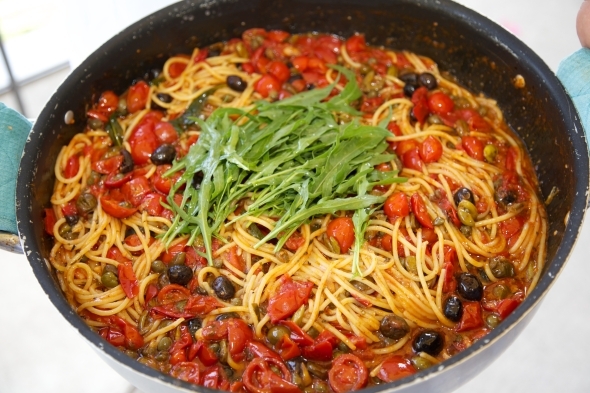 Another dish I loved was the Farmers Spaghetti with black and green olives, a combination that was a first for me. This dish was simple yet mouthwatering. You really tasted and appreciated all of the fine quality ingredients. To make it even better, Mamma used her very own homemade pasta. Can’t get better than that! 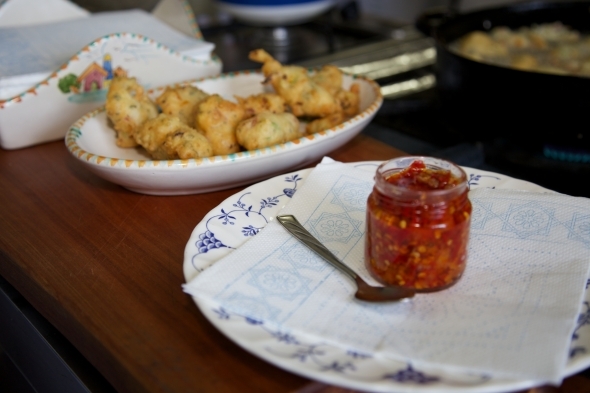 We watched Mamma fry bacon, herb and veggie fritters that she called Coccoli, and then popped them into our mouths right out of the pan. MMMMMMMM! Italians traditionally have pasta with every meal and our class luncheon included two pasta dishes! We also made Sausage and Bell Pepper Pappardelle. Mamma sautés the peppers in peanut oil first so they are easier to digest and more flavorful. Mamma’s own made from scratch sausage itself was incredible! We ended the afternoon enjoying all of the mouthwatering dishes that we watched come together, sipped on Gennaro’s house made wine and soaked up our last moments on the beautiful terrace, a place in which I felt was a little closer to heaven. 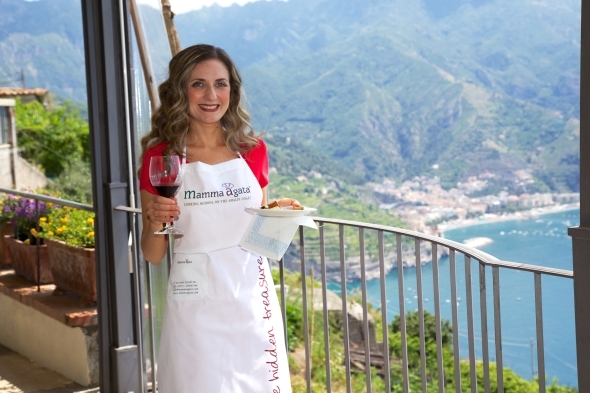 If you plan on traveling to The Amalfi Coast I hope you will take the opportunity to have this once in a lifetime experience. 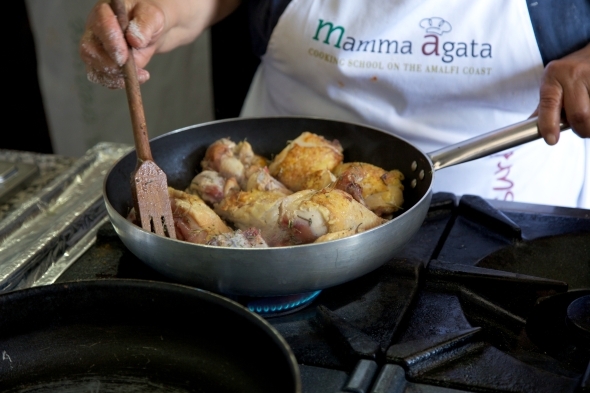 To schedule a class email info@mammaagata.com and visit www.MammaAgata.com for more information on the cookbook, classes and food products. 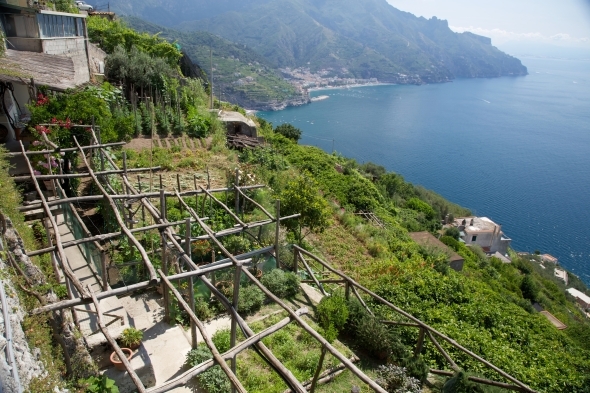 This may be the most beautiful herb garden in the world. One of my many moments of inspiration. Lemons for miles and the largest I’ve ever seen!